Afraid of fried chicken? Never fear, it is easier than you think! Not only is this kefir battered chicken super easy but you have never tasted such tender and moist chicken – it is delish! What says, “southern” better than fried chicken? OK, maybe fried chicken and sweet tea. The problem is, this southern girl doesn’t fix either! My tea usually turns bitter and I have always figured that if we want fried chicken, we can go out to eat! Besides, drinking water is better for you! So, imagine my dilemma when our soon to be 17 year old son requested, of all things, fried chicken for his birthday dinner … And watermelon. At our house, birthdays are a BIG deal and a lot of fun. The birthday boy or girl picks the meal and it is complete with a decorated cake, ice cream and of course, presents. So, I really try to give them the meal of choice and it has never been a problem until fried chicken was requested! My first thought was Sam’s Club, they should have something in the frozen food section that I can just heat up or cook in the oven. Then I was shamed. That did it. I was determined not to be ruled by fear of fried chicken ever again. 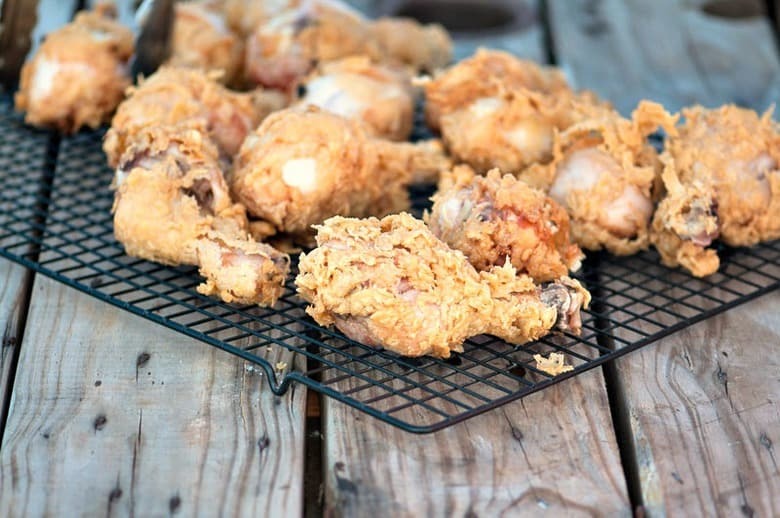 Even if it took several trial runs – I was going to get the hang of frying battered chicken! Actually, it was soooo much easier than I thought and the children loved the trial run! After consulting many, many recipes for fried battered chicken, I decided to try combining a bunch of them and results were fantastic – moist delicious fried chicken. Plus, we fried it outside so the house stayed cool! Steps To Making Fried Kefir Battered Chicken! Brining of the chicken is an important step to seal in the moisture so, don’t skip it! It sounds really fancy but it is simply soaking the chicken in a salt bath. 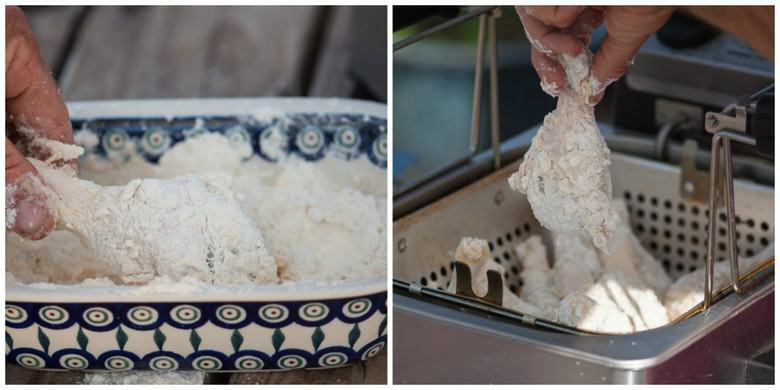 With the chicken, it actually soaks in some of the salt so, no salt is necessary in the flour used to dredge it before frying. It does take planning ahead to brine it, but trust me, the results are worth it. Soaking the chicken in kefir adds a tenderness that you have to taste to believe! The kefir begins to break down the chicken meat making it soft and tender. Don’t skip this step! Be sure to have the oil very hot to fry in. Once you take one batch of chicken out, allow the oil to heat up again so you are putting the new batch into hot oil. We have a fryer (available from my affiliate) that we use to fry foods like doughnuts and fish and it works great! It is large enough to fry a dozen doughnuts at once – with our crew, that is important! Don’t worry though if you don’t have one, you can fry it in a skillet too. Once the chicken is removed from the fryer or skillet, be sure to lay it in a single layer on a cooling rack NOT stacked on paper towels – that will make it soggy! 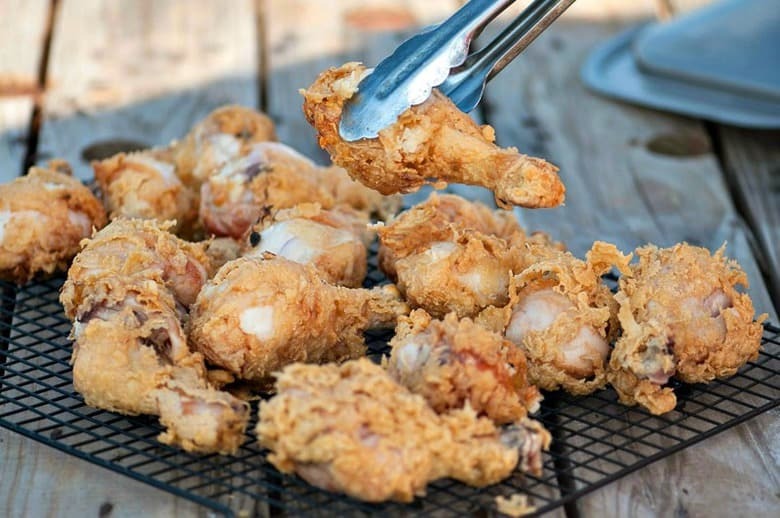 Phobia of homemade battered chicken – Be Gone! Let me just say, one more time, this fried kefir battered chicken is super easy and the taste is absolutely delicious! So, if you are like me and have had a lifelong phobia of homemade battered chicken, here is your cure. If you’ve tried this fried kefir battered chicken or any other recipe on Cultured Palate please take a minute to rate the recipe and leave a comment letting me know how you liked it. I love hearing from you! You can also FOLLOW ME on PINTEREST, FACEBOOK, INSTAGRAM, YouTube and TWITTER. Nothing beats fried chicken as a special weekend meal. In a large bowl, stir together 10 cups water and 2 Tbsp salt. Add the chicken covering all pieces with brine solution. Cover and refrigerate overnight. In another bowl, whisk together kefir, 1 Tbsp salt, mustard, paprika, 1/2 cayenne pepper (if using) and 1/2 tsp black pepper. Transfer chicken from the salt brine to the marinade. Cover and refrigerate for at least 4 hours and up to overnight. Remove the chicken from refrigerator an hour before frying - let stand at room temperature. Mix together flour, cornmeal, 1 tsp black pepper and 1/2 tsp cayenne pepper (if using). Whether using a deep fryer or oil in heavy pot (filled halfway with oil), heat oil to 350F. Remove chicken from the marinade a few pieces at a time - do not shake off excess - dredge in flour mixture. Fry chicken in batches until golden brown and thermometer inserted in the thickest part reads 160F. It takes about 10 minutes depending upon the size of pieces. Be sure to allow the oil to reheat between batches. Do not stack chicken on paper towel - this causes the crust to become soggy. The brining of the chicken is an important step to seal in the moisture so, don't skip it! It sounds really fancy but it is simply soaking the chicken in a salt bath. Looks soooo yummy! I love the combination of spices you used. This is a keeper. Pinned! What a great idea to use kefir, love your tips for soaking the chicken too I bet it makes a big difference! doesn’t frying it kill all the health benefits of kefir? JRlamp, you are right, the frying does kill the probiotics in the kefir. But, while you do not receive the health benefit of the kefir when eating it, the bacterial action of the kefir works on the chicken while it marinates making it very moist. It is delicious!